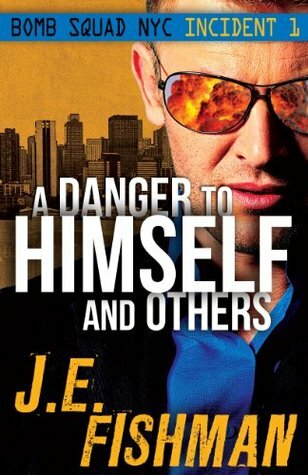 A fast-paced thriller with some surprising plot twists and a welcome emphasis on character development, I greatly enjoyed reading A Danger To Himself and Others, the first installment — or Incident 1, as author J.E. Fishman (@JEFISHMAN) cleverly calls it — in the new Bomb Squad NYC series. This review is based on a copy provided me for that purpose. When a disabled veteran detonates a bomb outside a military recruiting office in Times Square, New York Bomb Squad detectives Manny Diaz and Sandy Kahn must find out if it is the work of a lone suicide bomber or the harbinger of a new wave of terrorism. As they start piecing together the scant clues left behind, contrasting — and conflicting — theories begin to form between Diaz, an Army veteran who defused IEDs in Iraq, and Kahn, the Bomb Squad’s staid senior detective. Then another bomb explodes, increasing the pressure on Diaz and Kahn to solve the case before more explosions rock New York. To say much more than that would be to spoil the plot for future readers but I can say I devoured the book in a couple days, finding it tough to put down. At more than one point I thought I had a good idea of what was going to happen next only to have the plot go another direction entirely — and I absolutely love it when that happens. Although I loved many of the 87th Precinct novels written by Evan Hunter (as Ed McBain), in general I haven’t read a lot from the police procedural genre. That might change if I find more like A Danger To Himself and Others, which — like McBain’s 87th novels — places as much emphasis on the characters as the procedures. Looking at the blurbs for subsequent books in the series it appears the author has centered each around a different member of the Bomb Squad introduced in the opener, a smart idea in my opinion. I can’t say for sure, but based on the experts the authors cites working with, including the current head of the NYC Bomb Squad, the technical elements of the novel appear to be spot-on. A glossary of terms is thoughtfully included but the narrative doesn’t get bogged down in “techno-babble,” allowing the natural tension of scenes involving explosives to come across. The lead protagonist in A Danger To Himself and Others is Diaz, who has been part of the Elite Bomb Squad for nearly a year and is beginning to find the routine a grind compared to his days in Iraq. In post-9/11 New York there are plenty of calls for the Squad, but not many lead to any real action. On top of that, as the new guy Diaz has been paired with (babysat by?) Kahn and the more senior detective’s micromanagement is beginning to chafe. This is a good place to talk a bit about another issue that runs through the novel: Post Traumatic Stress Disorder (PTSD). As a military veteran myself, the trope of a “PTSD-crazed veteran going off the rails” is something I’m constantly on guard against. Growing up in the late 60s/early 70s, it seemed like every crook on TV was a drug-addicted and/or “crazy” Vietnam vet, usually wearing an olive drab field coat. These days some media outlets would have us believe that fiction is reborn as reality. Mr. Fishman has in my opinion done a good job of making the former military characters who do exhibit various symptoms of PTSD more fully realized than simply “crazy vet” caricatures. The truth, of course, is there are many forms and many degrees of PTSD; some veterans handle it better than others — with or without assistance — but “going off the rails” is an anomaly. My small quibble would be wishing there was some discussion of available counseling services, either through the VA or veteran peer groups. With interesting and diverse characters and the inherently exciting setting of explosive disposal in America’s largest city, the author has created a winning formula. If you’re a fan of police procedurals or simply looking for an engrossing read, I encourage you to take a look at A Danger To Himself And Others. For more on the author and his writing, visit his website. Pursue your dreams... and never look back.